On arrival in Southampton, you will be transferred to the port to board your cruise ship, the 5* Sapphire Princess. Zeebrugge is your gateway to Brussels. The capital of Belgium, Brussels is really two cities in one. Old Brussels is a city of superb Baroque architecture with ornate guildhalls, cobbled lanes and one of the finest squares in Europe. New Brussels is the modern city, the capital of the European Union, the home of NATO and the seat of the European Atomic Energy Community. It is a city of fascinating contrasts. Copenhagen was founded during the 12th century. The city owes much of its charm to the buildings erected by Denmark’s monarchs, and boasts a treasure trove of late-Renaissance and Rococo architecture. Copenhagen deserves its accolade as the Venice of the North. Founded on a series of islands and islets, the city today is laced with graceful canals and boasts some of the most delightful architecture in Northern Europe. See the fabled statue of Hans Christian Andersen’s Little Mermaid, a symbol of the city. Stroll along the old harbor of Nyhavn, lined with cafés, restaurants and 500-year-old gabled houses. Browse the superb shops on the world-famous Stroget or view the Rococo palaces lining Amalienborg Square. Best of all, savor the taste of local delicacies while wandering the paths of Tivoli Gardens, one of Europe’s most celebrated pleasure gardens. The small rocky harbour of Nynashamn is your gateway port to Stockholm, the “Capital of Scandinavia.” The city began life over seven centuries ago as a Viking stronghold built on the island of Gamla Stan. Today, Stockholm covers 14 separate islands and is interwoven with bays, channels and inlets. The city skyline is a sea of copper roofs grown green with patina, towers, spires and graceful cupolas stand sentinel over the historic Old Town (Gamla Stan). A city of nearly a million people, Stockholm is one of the world’s most beautiful, clean, and orderly metropolises. With a history stretching over seven centuries, Stockholm is not just a beautiful city but also Sweden’s centre of art and culture. Note: Your ship will anchor in Nynashamn and use launches to transport all passengers ashore. Like Latvia and Lithuania, the Baltic republic of Estonia has survived a turbulent history. The small nation was conquered and ruled by the likes of Teutonic Knights, Polish princes and Russian Tsars. For 51 years, Estonia remained a pawn in the Soviet empire, until the burgeoning freedom movement led to independence for the Baltic Republics in 1991. Like its sister republics, Estonia maintained its ties to the Western tradition, retaining the Latin alphabet and Catholic and Protestant faiths. Once a member of the historic Hanseatic League, Tallinn is the political, commercial and cultural centre of Estonia. Perhaps their country’s harsh climate encouraged the Finns’ love and respect for design and the arts. Whatever the cause, there’s no denying that Helsinki is one of the most vibrant and beautiful cities in Scandinavia. Hailed as the “Daughter of the Baltic,” Finland’s capital is a city of graceful neoclassical buildings, striking modern architecture and spacious boulevards dotted with squares and parks. In the past century, Finland has nurtured some of the major creative talents of Western culture, from the composer Sibelius to architects Eliel & Eero Saarinen and Alvar Aalto. The centre of Finnish commerce and culture, Helsinki is home to some 616.000 people. Much of the city’s neoclassical architecture dates from the period of Tsarist rule, which began in 1809 after political control of Finland passed from Sweden to Russia, Finland gained its independence in 1917. 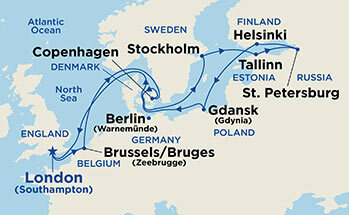 Gdynia is your gateway port to Poland’s fabled city of Gdansk. The city is over a millennium old – the first mention of Gdansk in history occurs in the year 997 A.D. A member of the Hanseatic League, Gdansk was the richest port on the Baltic and a cultural center that drew artists and intellectuals from across Europe. That heritage was imperiled, however, on September 1, 1939, when a German warship opened fire on a garrison north of the city, heralding World War II. By the war’s end, Gdansk was in ruins and proud Poland lay in the grip of Russian occupation. The city proved indomitable as residents set about rebuilding the old city. In 1980, the spirit of Gdansk’s people proved even stronger than the iron grip of communism: a food riot led to the birth of Solidarity, the trade-labor movement that played a pivotal role in bringing down the Iron Curtain. Gdansk is one of the amber centers of the world. This petrified tree resin has been revered for both jewelry and as a source of folk remedies for centuries. Gdansk’s Old Town is a superb place to browse for amber jewelry and goods. Following your departure from the Sapphire, you will be transferred to the airport to catch your flight home to Dublin. Special Offer! Free Onboard Credit!